TRENTON, N.J. - New Jersey Gov. Chris Christie opened up about his weight problem in an interview with ABC News and stressed he is "trying" to lose weight, a battle he's waged for 30 years, but said he's never considered gastric bypass surgery because it's "too risky." "I mean, see, listen, I think there's a fundamental misunderstanding among people regarding weight and regarding all those things that go into, to people being overweight," Christie said in an interview that will air Tuesday on "Nightline." "I think folks say - yeah, well he must just not be disciplined, you know, or he must not have willpower - that kind of thing. I guess the best analogy to make is some people drink too much. Some people take drugs. Some people eat too much. See, you can go live every day without drinking. You can live every day without taking drugs. You can't live every without eating." Watch ABC News' Jake Tapper's full interview with Gov. 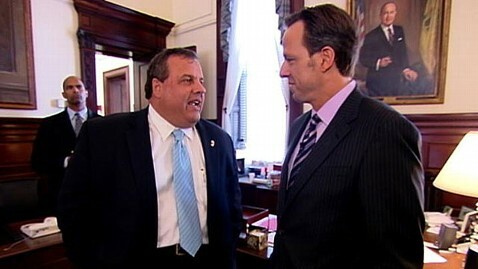 Chris Christie on "Nightline" tonight at 11:35 p.m. ET. Christie, who often jokes about his weight, but rarely opens up about the struggle, acknowledged that "it's a really difficult thing to deal with." Christie said he works out with a trainer four days a week and is "trying to eat better," but said it's "really difficult like to eat better." "With running around all the time and grabbing things on the go. But I'm trying to eat better," Christie said in the interview from the state capitol. "I'm working at it. But obviously, I'm not there. But I also have hope that I can get there." Christie suffers from asthma and was admitted to the hospital last summer, but said besides that ailment he is healthy and sees the doctor regularly. "My blood pressure's fine, my cholesterol is fine," Christie said. "I'm in good physical shape in terms of those indicators. But I have to lose weight and I get it." Christie said there are two types of people who approach him about his weight: those who "really genuinely are concerned about me and want me to be around for a long time, and really care about me" and some of the people he sometimes encounters on his Twitter feed. What advice does Christie have to offer Mitt Romney? Read more here. "There are some people who are just - you know, incredibly nasty and, and ugly and horrible," Christie said. "That's just the way it goes. I mean, you know, people have that kind of prejudice about them. I can't do anything about that." Christie said he's "doing the best I can" and will "continue to." "I've been living with it for a long time, and I'm going to try to get better," Christie said. "And if I can get better, that'll be great for me and for my family and for the public who likes me … it's something that's not easy. If it were easy, I'd already have it fixed."